Website and processes: 30 Mar 17 Joe, 5/5 Excellent "Website easy to navigate with clear information and instructions given. Purchasing process straightforward and completed within minutes. " This experience will last a total of approx. 2 hours with approx. 2 hours in the saddle. Most little 'uns go through a pony stage, and here is the perfect birthdday treat for pony-mad children! This half-day session provides a mixture of stable management - a chance to experience a little of what it's like to own their very own pony - along with a riding lesson, followed by a hack or mounted games. All activities are tailored to suit the children's abilities. Sessions are from either 10am to 12 noon or 2pm to 4pm, and are followed by the Birthday Tea, which is provided by us, you just bring the birthday cake. Availability: All year round. Tuesday to Sunday. Maximum of eight children Enquiry Plase use the 'contact us' link on any page fo the site. Event takes place at a BHS Approved riding centre with qualified BHS Instructors. All clients must wear a current BSI standard riding hat at all times when mounted (these can be hired from the Centre if required). Boots with a small heel and flat sole must be worn. Please arrive 10 minutes before you are due to ride to complete a Rider Registration Form. Unless 24 hours notice is given to cancel any service provided by the Centre, the voucher will be forfeited. Vouchers are non-transferrable and valid for 12 months from the date of purchase. Each voucher entitles up to 3 people	to participate in this experience. The voucher is non-transferable, which means that only the person named on the voucher can use it. The voucher remains valid for bookings for 12 months from the date of purchase. Please contact the operator	using the details printed on your voucher to arrange a date for your event. Not suitable? We have a great choice of horse riding experiences for you to choose from at locations throughout the UK and Northern Ireland. 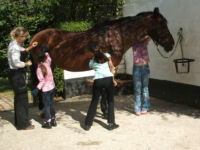 We can also arrange horse riding sessions for your stag or hen celebration, or for corporate events. Alternatively, our fully flexible Hotseat Coupons make an ideal gift - your recipient can use them to purchase or part-purchase any experience on any of our sites.